Samsung and Google's devices yield the best skin tones, detail, colors and more. We use the selfie camera on our smartphones up to 40 percent of the time, yet most testing puts the emphasis on the rear camera. To address that issue, DxOMark has introduced scoring for front-facing smartphone cameras based on criteria like skin tone and color accuracy, sharpness, contrast, exposure and more. A number of cameras have already been tested, and the models on top, by a wide margin, are Samsung's Galaxy Note 9 and the Google Pixel 3, both with overall scores of 92. Rounding out the top five were Xiaomi's Mi Mix 3, the Apple iPhone XS Max and Samsung Galaxy S9 Plus, with scores of 84, 82 and 81 respectively. DxOMark did both objective and subjective tests in controlled conditions and even developed a dummy with realistic skin tones for consistent, repeatable scores. Image scientists analyzed over 1,500 photos and two hours of video for each device with an eye not just toward accuracy, but the most pleasing results. Marks were deducted for over-beautification that yielded unrealistic, smoothed out skin tones. While the Pixel 3 and Galaxy Note 9 both came out on top, they did so for different reasons. "Image results from both cameras are excellent, with a good balance between various image quality attributes," the compay in a press release. 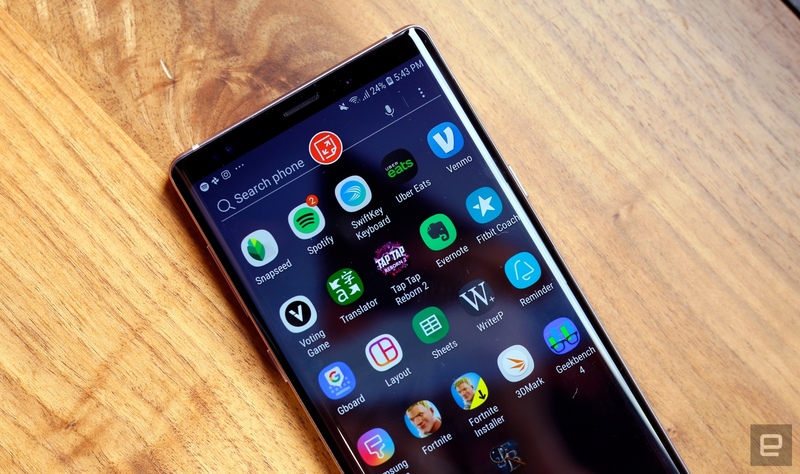 "However, while Google puts a lot of emphasis on texture and detail and therefore accepts some noise, Samsung engineers have opted for a cleaner image and made some sacrifices in terms of fine details." The Pixel 3 was best for photos, while the Note 9 led the pack for video. Selfie camera scores don't necessarily correlate with the main camera. DxOMark ranked the Huawei Mate 20 on top of that scale with 109 points, but gave its selfie camera a score of just 78, for instance. If you add the scores together, the Galaxy Note 9 comes out on top with 195 points, and the Pixel 3 is in second place with 193. Tests are just tests, of course, and your mileage may vary depending on the kind of shooting you do. It's important to note that usability is also a crucial factor, which is one reason why Engadget scored the Pixel 3 ahead of the Note 9 in our own camera shootout. However, DxOMark's testing underscores the increasing importance of the selfie camera, and depending on the kind of shooting you do, could be the difference-maker in your phone buying decision.